Pachysandra terminalis (Japanese spurge) is a groundcover that has to be controlled here in zone 7. This native of Japan spreads like wildfire in shady areas under the canopies of the Oaks. This evergreen groundcover is sold and grown in zones 4-9 and can be invasive anywhere. Pachysandra is sold every year in the garden centers at the big box stores. Why? Because it is so easily propagated by either dividing the plant or rooting in water. Pachysandra grows by rhizomes which become intertwined and are easily pulled apart only inches below the soil. It may take a couple years for Pachysandra to take hold under a tree where it will take over and choke out any weeds (or any other beautiful perennial). 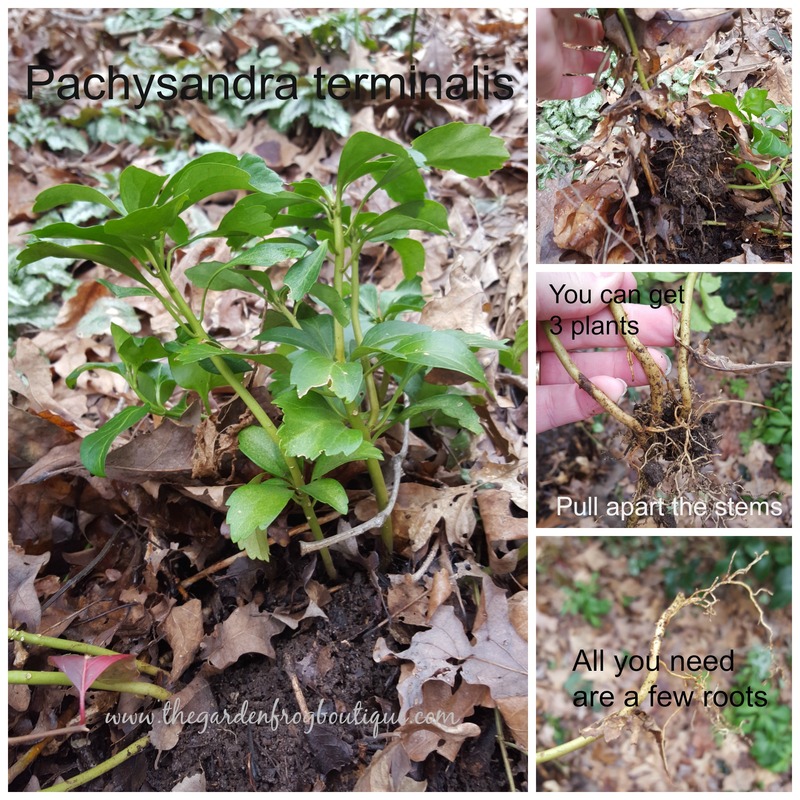 You can also take a softwood (or green cutting) of the Pachysandra and put it in water and root it. This plant has glossy thick leaves which stay evergreen and are not even phased by nights dipping to 10 degrees. If you choose to grow this plant, it must be contained by a barrier of at least 3″ underground and at least 2″ or higher above ground (I have seen the plant grow over a stick in my back yard). This plant does flower but they are not that attractive and are not grown for the flowers. Here in zone 7 the Pachysandra is setting its flower buds and will probably be blooming in early March. I have to confess I once planted this about 7 years ago and have not been able to kill it yet. It creeped into a wooded area where I do not want it to grow since it is not a native and deer will not eat it. It is a deer resistant plant and groundcover for areas that no other plant will grow but I urge you to keep it contained. Even fallen Oak leaves do not deter this plants growth so keep this in mind. Thank you for stopping by and reading my posts. I confess I have planted invasive plants and realize the time and effort it takes to keep them contained or remove them after they have taken over a spot. Gardening is my passion and one that I love to share because I have made some mistakes myself. If you ever have a question, feel free to ask.